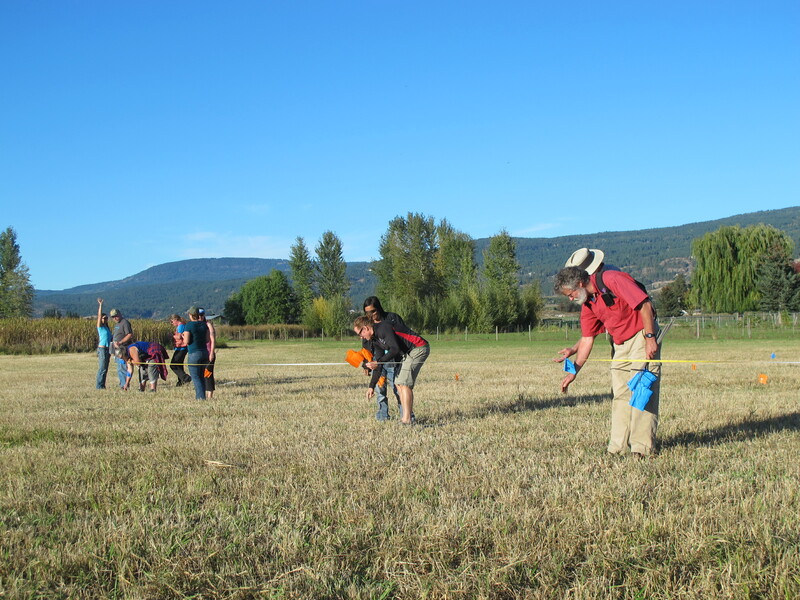 The passion for wetland restoration and protection drew participants from all over BC to the Okanagan to attend the BC Wildlife Federation’s 13th Wetlands Institute, aiming to gain the skills and knowledge needed to complete their own wetland projects. 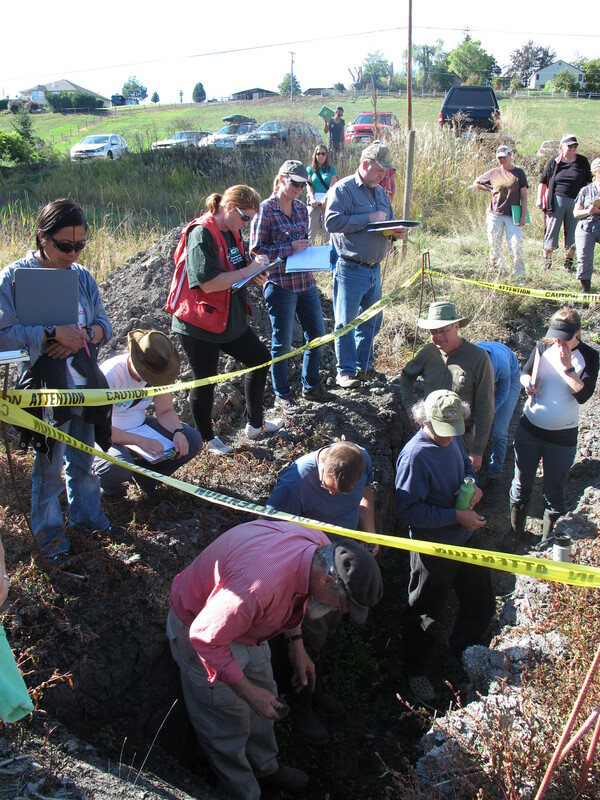 We had quite the range of participants including Biologists, Landscape Technologists and Architects, Environmental Planners, Coordinators, Educators, Consultants and more. 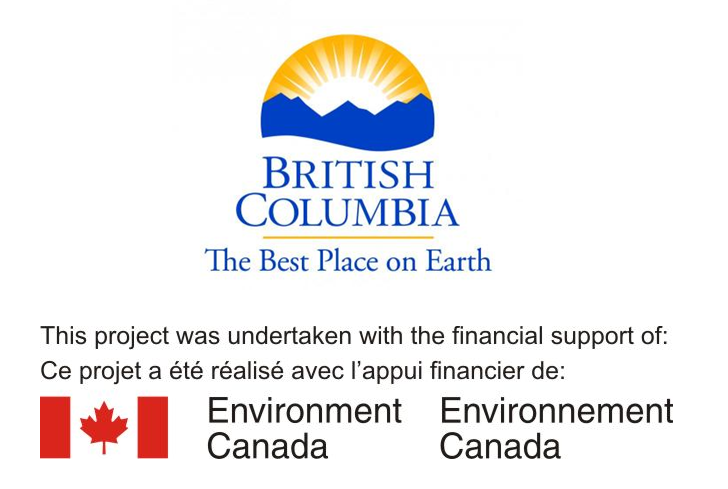 We were joined by members of Environment Canada, the Okanagan Nation Alliance, the Okanagan Collaborative Conservation Program, the Okanagan Basin Water Board, and the Ministry of Forests Lands and Natural Resource Operations, to name a few. Participants laying flags at Curly Frog Farm to mark the boundaries between the wetland area, the slopes and the ‘chinampa’ area. We dove right in on the first day with a presentation on wetland restoration techniques from Tom Biebighauser, a wildlife biologist and wetland ecologist. 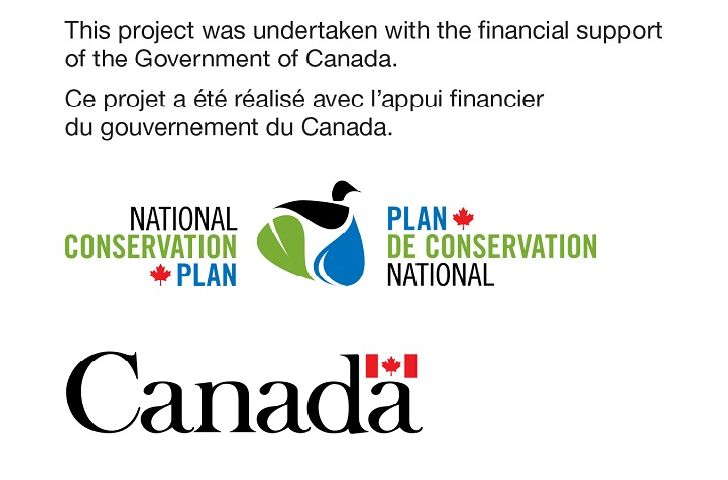 He covered various strategies for wetland restoration and construction. With this information fresh in mind, we headed over to the Curly Frog Farm in Kelowna to plan a restoration project on site. Flags were laid out marking the boundaries of the wetland areas and the sloped areas where the soil was to be built up creating chinampa-like structures. 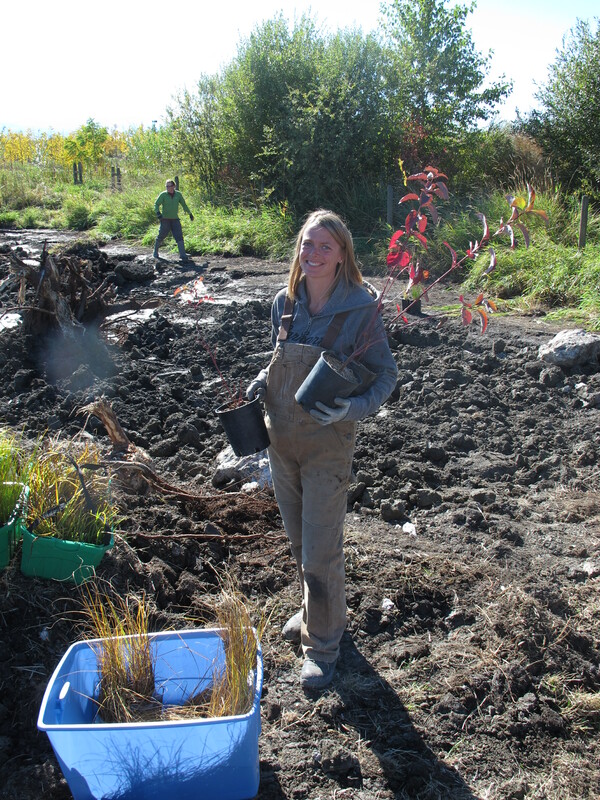 The “chinampas” (Please click here for a description) will allow property owner, Brenda Dureault, to grow crops on the raised land while having valuable wetland habitat directly adjacent. Here, participants also learned how to use a rod and level to take elevation readings and how to use an auger to take soil samples. Participants testing soil at the Radies site. We returned the next morning to observe the excavator begin to build the wetland right before our eyes. We then took our first visit to Wayne and Wendy Radies property in Vernon to discuss planning of the wetland restoration at the second site. We ran through a wetland design form created by Tom, which had everyone thinking about head-cuts, inflow, outflow, where to move the soil, slopes, etc. There were two tests holes dug and no ground water was found. After some soil tests it was identified that the bulk of the soil was clay and could be compacted into a liner to hold water. This year the Institute participants had the privilege of seeing two types of wetlands constructed: a groundwater wetland at the Curly Frog Farm and a clay liner wetland at the Radies site. We finished Tuesday with a presentation from Tom on “How we pulled the plug on North America”. We learned just how common it was to drain wetlands in the past for agriculture and construction. The presentation focused on wetland drainage techniques and their impacts on the land; highlighting the importance of restoring the lands back to their natural state where possible. Many of us are now walking around seeing through a new lens, seeing evidence of drained wetlands everywhere. 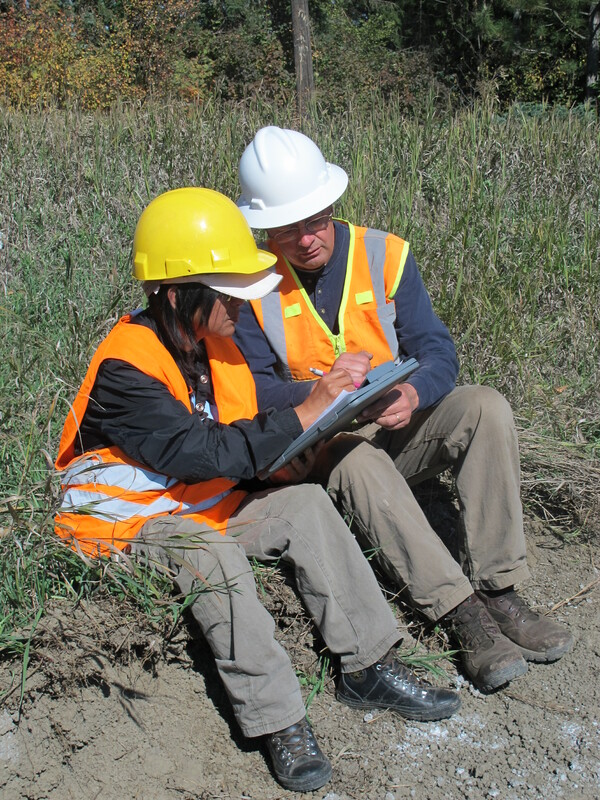 Tom Biebighauser helping participant with wetland restoration form. The institute participants started Wednesday morning with a presentation on landowner contact from Shawn Black, formerly with The Land Conservancy of Canada, Land Trust Alliance, and Okanagan Similkameen Conservation Program. This high-density presentation covered a half-day workshop in a mere 90 minutes! This was followed by participants returning to the Radies site to observe initial construction of the site. The afternoon featured a presentation by Jim Dumont, a Senior Water Infrastructure Engineer, on stormwater management and how to incorporate wetlands into development design. We then visited Marshall Fields where site engineer Bill Mahoney from Stantec gave us a tour and explained the construction at the site. We saw two wetlands at the site that had been incorporated into the construction plan to play a role in stormwater management. Thursday was a jam-packed, fun-filled day starting with Don Gayton (contractor with Okanagan Basin Water Board and Grass-land Specialist) introducing the group to the Okanagan Wetland Strategy. Neil Fletcher then gave a presentation on wetland classification based on soil, pH, mineral content, water flow and more. We then had a presentation from Josie Symonds (Ministry of Forest, Lands, and Natural Resource Operations) on alkali wetlands, which are wetlands that have alkaline water and soil giving them unique plant types. Josie also discussed species and ecosystems at risk and touched on provincial wetland guidance with the group. Don wrapped up the morning with a presentation on grasses, sedges, rushes, cattails, and horsetail species of the Okanagan. As part of his talk he introduced many of the common invasive species and stressed that alkalinity is very influential over plant communties. 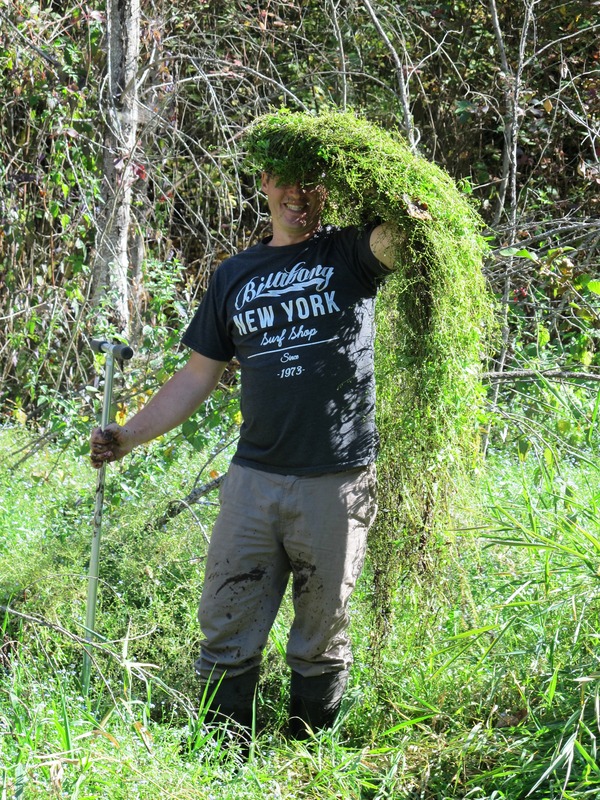 Participant at Scenic Canyon Regional Park who found some thick vegetation while trying to get a soil sample. Next on the agenda was the Scenic Canyon Regional Park where we explored some flooded transition areas (and some very thick vegetation in the shallow water which made a lovely wig). 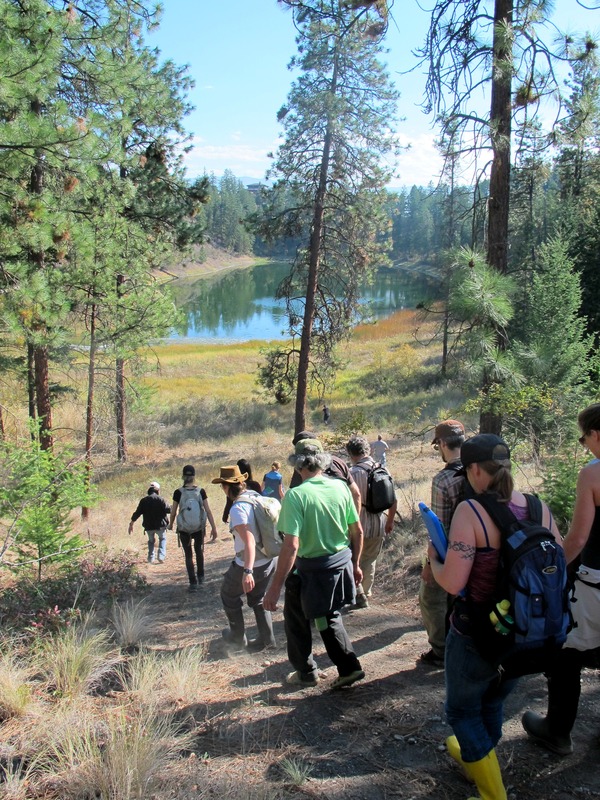 The group then headed up Knox Mountain and walked the beautiful trail to Kathleen Lake, an alkaline wetland. 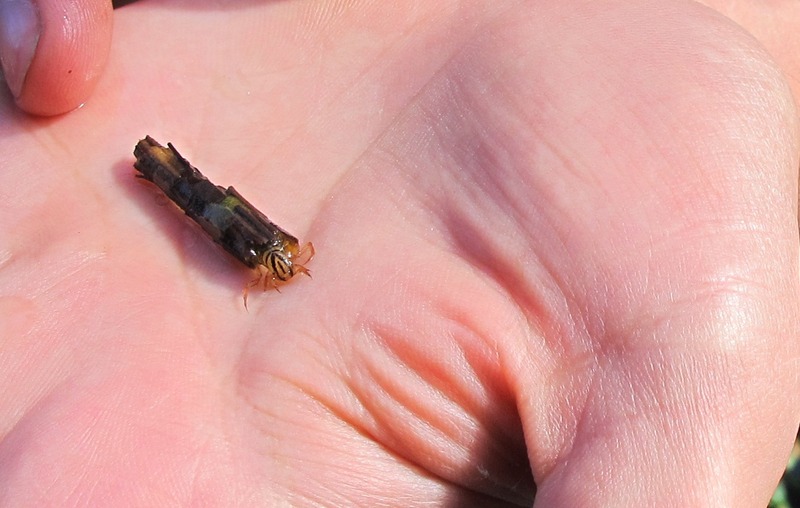 We saw many different types of invertebrates and identified three dragonfly species. When testing the water we found a very high pH of 9.89 and a very high conductivity reading, in addition to seeing a salt ring all around the wetland. Josie Symonds explained the difference between alkali wetlands and saline meadows and dug up a soil sample in the wetland and about 2m away in the saline meadow to show us the difference. Due to their often-immediate proximity, saline meadows are often associated with alkaline wetlands; however there are differences between the two environments in terms of how water influences these communities. A unique plant community of Bolboschoenus maritimus was also found along the Northern edge. Heading down the trail on Knox Mountain to Kathleen Lake, an alkaline wetland. The last site visit of the day was to a turtle crossing site in northern Kelowna that was constructed to help turtles safely travel from one wetland area to another across the road. Turtle droppings were observed at both entrances to the crossing culvert, indicating path use. However, it did not appear that the fencing on both sides was fully intact and a recently killed turtle was observed on the road above the culvert indicating that some turtles are able to get under or around the fencing. Thursday was concluded by a presentation on bird banding by René McKibbon, an Environmental Assessment Officer of the Canadian Wildlife Service. Participants learned about the requirements, history, and many uses of bird banding which they then got to observe on Friday morning at Curly Frog Farm. Eight birds were captured for banding before being released. We then had a short session on GPS training before heading over to KLO Middle School to observe construction activities at the Fascieux Creek project. Bird banding at Curly Frog Farm. Can you spot the net? Darryl Arsenault from Golder Associates, Michelle Hamilton from KLO Middle School and Carol Courtney from the Central Okanagan Naturalists Club explained the process of gaining approvals, planning for the project and the construction phases as well as the bumps along the way for the Fascieux Creek naturalization. One major take away was to be persistent in gaining approval and reaching out to others for help where needed (i.e., identifying someone with knowledge on the various stages to implement the project). We all headed back to the classroom at Winfield Easter Seals Camp for a few more presentations. 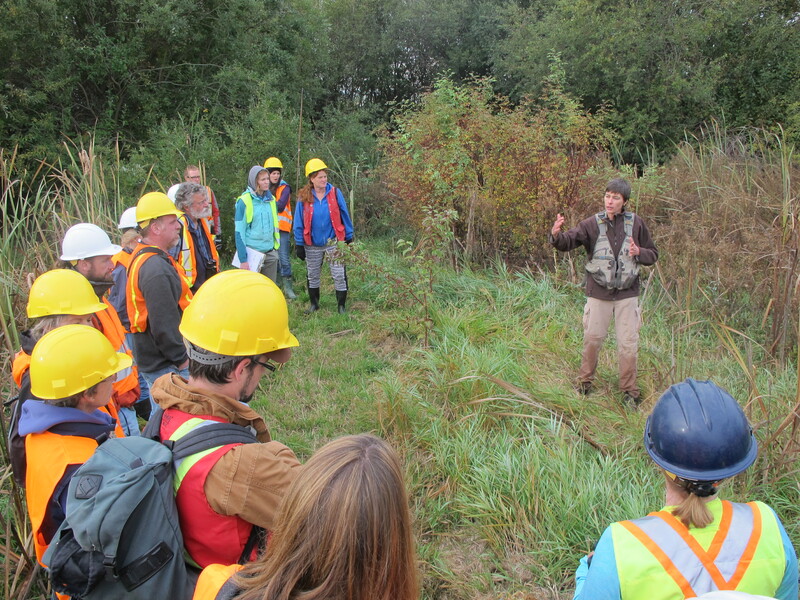 Clinton Coates from Golder Associates taught the participants about the process and regulations around doing work on a potential or known archeological site; advising us that berms or hills around wetlands may be potential hotspots for artifacts. Josie, with FLNRO, then presented on the 4 types of wetland legislation in BC as well as the tools that local governments have for wetland protection. She discussed the gaps in legislation but also pointed out that the current tools can be used more often. Graham Watt, an Environmental Planner and Geographic Information System (GIS) Specialist, then gave a presentation on the Kettle River Watershed and Landscape Level Planning. Graham discussed the impacts of sedimentation on watershed health and discussed his findings about safe buffer distances to minimize sedimentation. We were also privileged to have Richard Armstrong from the En’owkin Centre in Penticton join us to hold a powerful discussion on his connection with the land and the history of the land relating to water. He explained the First Nations spiritual connection to the watersheds and expressed the importance of conserving and restoring the land we have. His discussion inspired many of us and left participants more motivated to complete their projects and work closer with First Nations on projects. Friday ended with Graham holding an optional presentation on Q-GIS software, a free, open-source system that can be used for data analysis and offers a quick projection mode as well. This is a great data analysis tool and it comes with a user guide and training manual to instruct people on its uses. Participants identifying invertebrates at Winfield Nature Reserve. Saturday was a busy day starting off with a soil identification activity where Neil Fletcher led groups in identifying three mystery soils by completing a series of simple tests that can also be performed in the field. We were then joined by Thompson Rivers University professor Brian Heise, who gave a presentation on wetland aquatic invertebrates. Brian’s contagious enthusiasm had the whole class standing up pretending to swim like predaceous diving beetles. This theme carried into the field at the Winfield Nature Reserve where participants caught live invertebrates from each of the ponds. 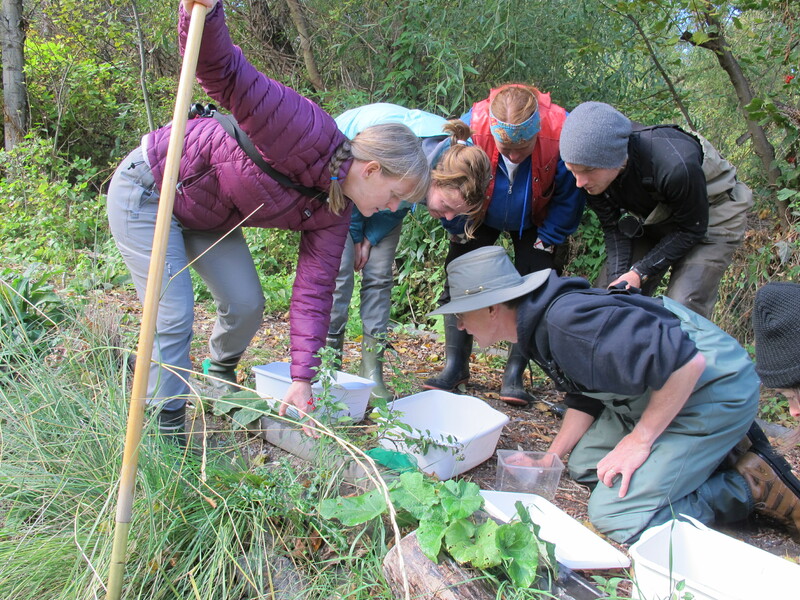 Participants found all sorts of invertebrates including: dragonfly, damselfly and caddisfly larvae, leeches, snails, amphipods, water boatmen, mayflies, predaceous diving beetles, crawling water beetles, nematodes, water striders, and cranefly larvae. 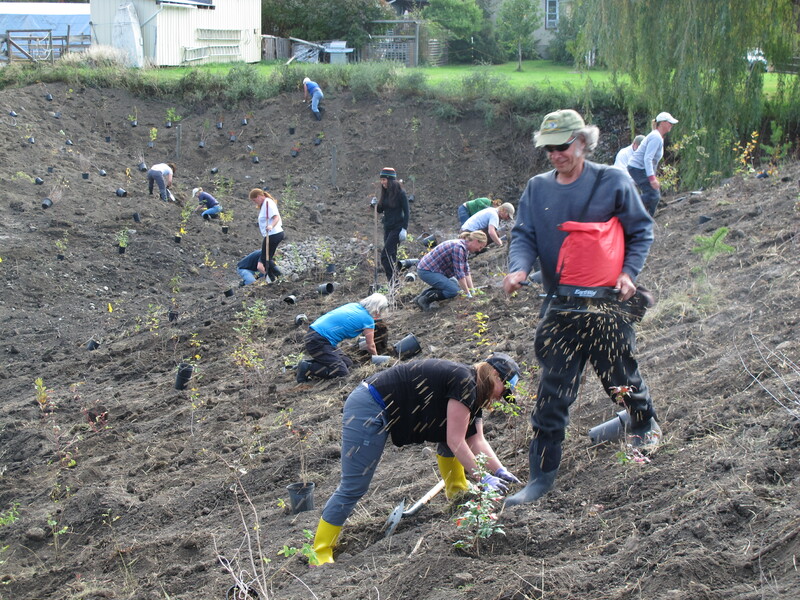 Participants planting and seeding at the Radies site. It was now time for planting at the Radies Site as construction was complete. Within 2.5 hours we planted over 600 plants, spread top soil, and seeded the grounds with oats; making it a very successful planting session. Participants broke out into groups after planting to compete in a “build the best frog and toad house” activity around the wetland. Neil was the judge checking for suitability of habitat of the houses and picked the top 3 as winners. Now tired and dirty we returned to the classroom for a wetland model building activity. Under Tom’s guidance everyone built the design of their current wetland projects or the design of their ideal wetland using modeling clay. The containers allowed for the different layers to be seen which is useful to visualize for clay-liner or other liner wetlands. Participants kept their models to help them visualize their wetlands during construction of their project. Saturday ended with a much needed social night of board games and a movie on wetland restoration in Iraq. The last day of the Institute kicked off with a presentation on successful grant writing by Neil Fletcher. Neil explained what is needed for a successful grant application and gave helpful tips for the writing process. Many participants took a lot away from this presentation. Neil then led the group into sharing their future steps with regards to their wetland projects and conservation plans. Everyone shared their thoughts on the three topics: head, heart, and hand; meaning what have they learned, what they loved, and how they will apply their new skills and knowledge. 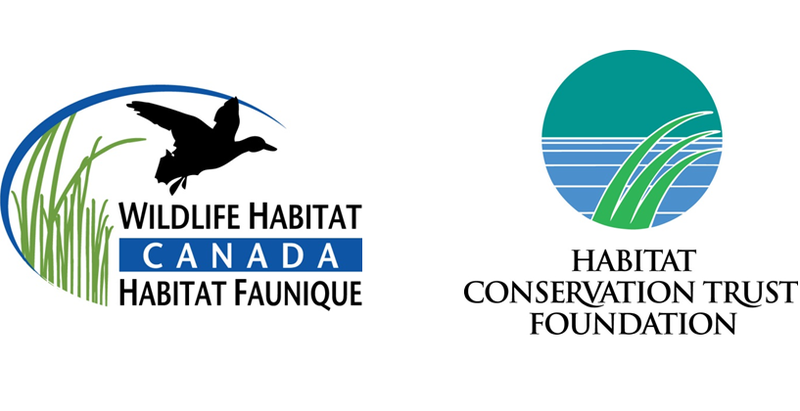 This was an emotional time for many of the participants and coordinators who have been deeply inspired throughout the week to pursue wetland conservation and restoration, and overcome their own personal fears or hesitations. Participants ready to plant at Curly Frog farm. 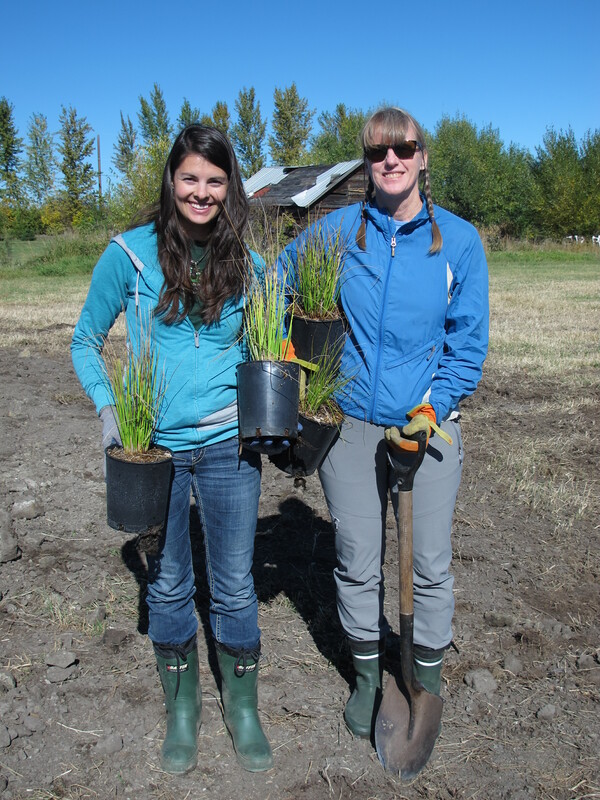 Participants strategically placing plants throughout the wetland. The Institute concluded with a planting session at the Curly Frog Farm site. Over the last 6 hours of the Institute, the group put in their sweat and work to strategically place and plant over 1300 plants, seed the entire wetland area and lay straw over all of the seeds and soil on the slopes. After a hard day’s work, the Institute came to an end and everyone said their good byes. Click here for all Wetlands Institute 2015 photos and click here for a full report of the Wetlands Institute (Coming soon).